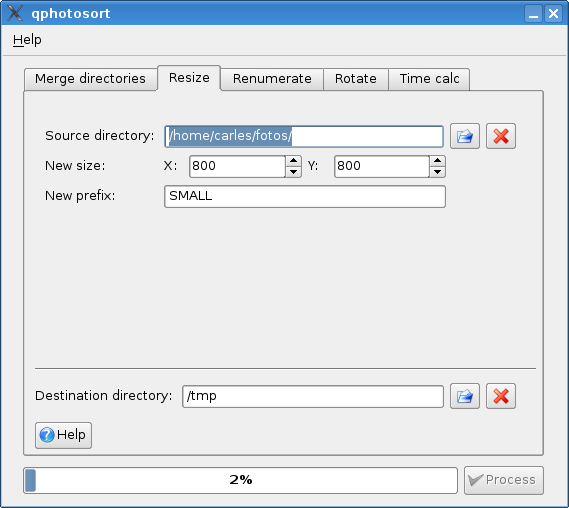 It is possible to use qphotosort in graphic interface or command line mode. It is recommended to use the graphical interface though.The current state of the program is beta. I encourage you to backup your photos before work with qphotosort. Anyway, I (and some friends) have been using long time before release without any problem. There is some small issues that can be improved (cosmetic details, translate to catalan, etc.). I will do it in the future. 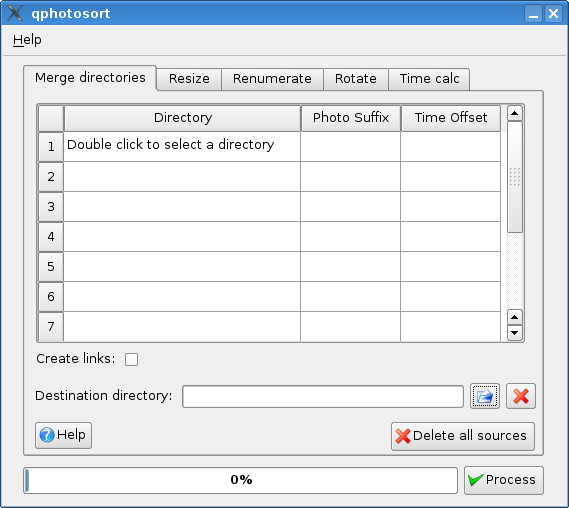 qphotosort has been programmed using Python, Qt4 and using external programs. The license is GPL 2.0 or later. The application is modular and this is the reason that can be used in graphic interface or command line (using the same core). The main purpose of qphotosort is to organize chronologically a collection of photos. This kind of problem is really common: a group of friends go on an excursion and each friend has his own photos, with diferent digital cameras. If you want to watch the photos using different ways, programs, web, etc. you will find it horrible because photos are not chronologically sorted. Usually, most applications first show of X person, then photos of Y person and so on. Using qphotosort will allow us to change the name of photos in order to have it in uniform way. 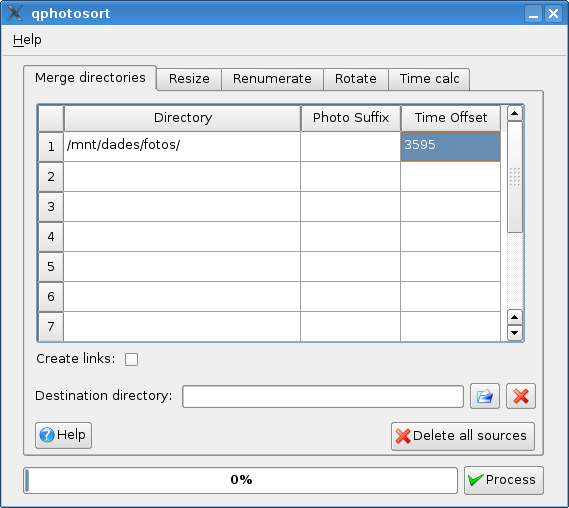 In qphotosort user adds some directories in a list, and then qphotosort will pick each photo and copy (or link) with a new name: year-month-day-hour:min:sec-suffix.JPG. Thanks to that feature, we will have all photos in the same directory and correctly sorted (as all applications sorts photos by name, at least).It is not possible to use the date of the files because this date is easily lost (copying photos, backups, CD’s, etc.). There are some applicatoins that allow watching photos in a chronologically way based on Exif date. Unfortunately, that doesn’t happen in all applications, photo albums, etc. 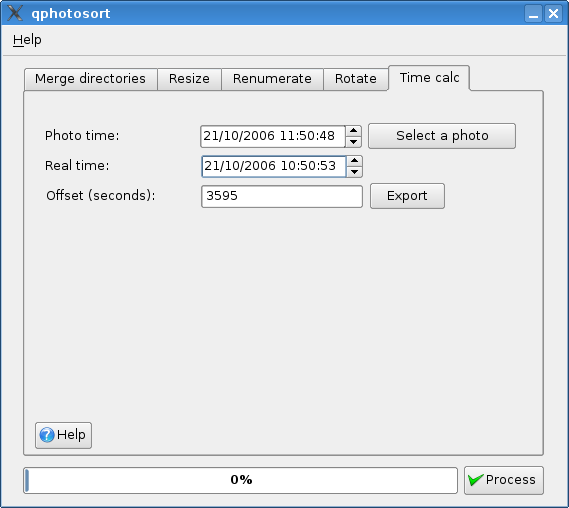 qphotosort also allows you to add offset in some directory because some people don’t set up the date of the camera correctly. It also allows you to calculate this offset. you can add a suffix to the new photo name indicating the name of the person who took it. 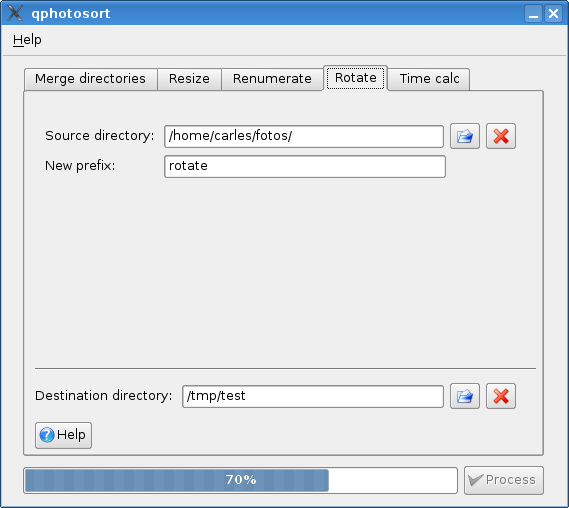 qphotosort also includes a functionality to resize the photos from one directory. It calls “convert” program from the ImageMagick package.It also includes a system to rotate photos if the information is available in Exif fields (it depends of the camera). It will modify Exif field to be coherent with new photo-position. Finally qphotosort can renumerate photos. For example, imagine that you have one directory with some photos (like “hello.jpg”, “kids.jpg”, “balloons.jpg”). Using “renumearate” function you will be able to turn those strange names into “party-001.jpg”, “party-002.jpg”, “party-003.jpg”. Here you can add directories (writing the whole path or double clicking to have a dialog). In suffix column, the suffix that will be added to the photo name. In offset column, how many seconds will be added (or substracted) from Exif date/time. Anytime, if you leave the mouse pointer over a field, you will get some “tip”. There are some missing options in the command line wrapper (for example, add an offset, the tool to help to calculate the offset or make links and not copies). Currently, photosort is not giving information about the progress in command line.If there are any users that request a better command line support (more information, add missing options) drop a mail (carles AT pina.cat) and I will be glad to do it. If anybody has any suggestions, ideas, bugs, etc. drop me a mail. If there is a bug, try to send as much information as you canIf you have any question, feel free to ask. If you find this program usefull, feel free to say it too! If I need a mailing list, bug track system, etc. I will search some place to upload it. It is a little time expensive, so my apologizes to have qphotosort just inside a WordPress, while I don’t need anything more powerful. qphotosort uses other 3rd party programs, all of them are available under free licenses.